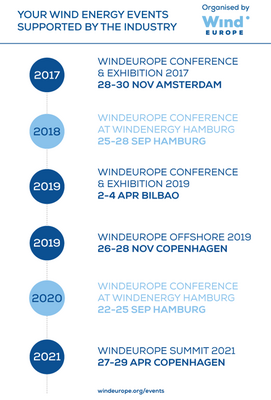 In collaboration with the wind energy industry’s major players, WindEurope ( formerly the European Wind Energy Association (EWEA)), today unveiled its new long-term events calendar. Together with its members and long–standing partners, WindEurope has developed an extensive events strategy to address the needs of what is a highly dynamic and innovative sector. The WindEurope events, comprising both a vibrant industry exhibition and a cutting-edge conference, will take place in the best European destinations. Enercon, Siemens Gamesa Renewable Energy, Vattenfall and Vestas are the strategic partners for the 2017 event this November in Amsterdam, while the 2018 conference will take place in combination with the WindEnergy Hamburg trade fair in September. Bilbao will be home of the 2019 industry get-together, with Acciona, Iberdrola and Siemens Gamesa Renewable Energy being the hosting partners, while Copenhagen will turn into the Offshore wind capital, holding the WindEurope’s Offshore 2019 conference and exhibition. The wind industry has supported the Association’s events over the past 35 years, during which time wind energy has grown and matured enormously. The WindEurope events bring together the worlds of business, politics, science and innovation - and they help to fund the activity of the Association that represents the whole industry and engages governments and other stakeholders on its behalf.